Living in New England (a.k.a. The Land of the Six-Months-Long Winter), I think it’s fair to say that I’ve become strongly skilled at inventing healthy yet still hearty comfort food recipes. 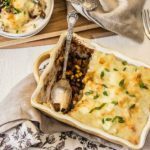 And I’m ready to say that this vegetarian shepherd’s pie is one of my absolute favorites (and one of my husband’s too) in the healthy comfort food category. 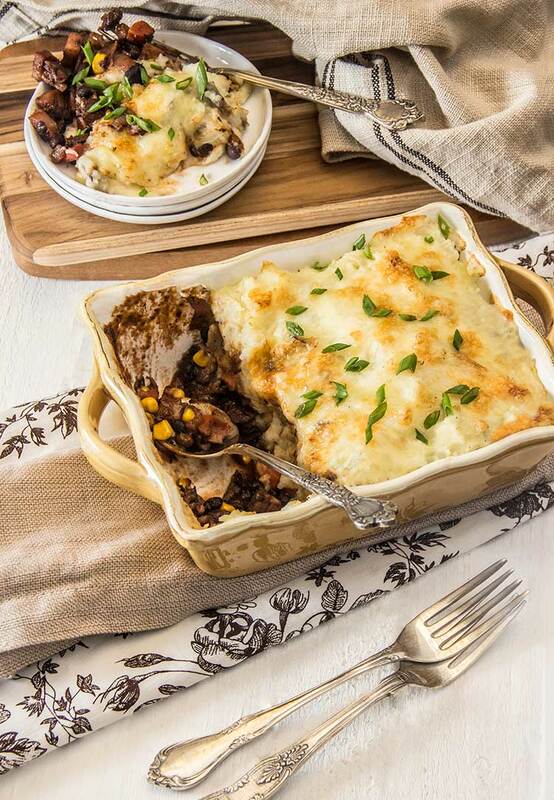 It’s a vegetarian shepherd’s pie that’s so richly flavored, so addictingly scrumptious, it’s tough to resist seconds. 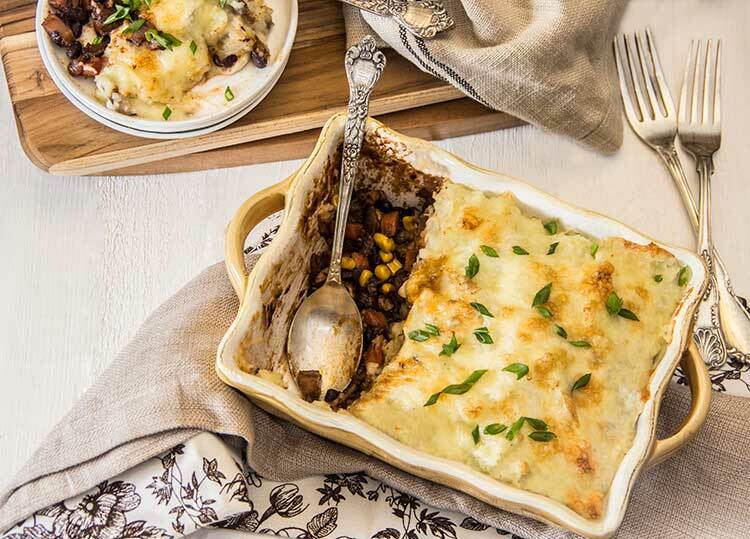 So what makes this vegetarian shepherd’s pie so hearty and indulgent-tasting and flavorful? It’s all about the combination of delicious fresh winter veggies – like carrots and parsnips – in the filling. Combined with black beans for heartiness and a couple of secret ingredients for flavor (more on that later!). And some sharp cheddar cheese for lots of rich flavor. It’s delicious, but also nourishing and healthy. My favorite part: when the cheese on top of the potato crust gets all deliciously crispy and golden after cooking in the oven. This Shepherd’s Pie is the ultimate winter comfort food with a modern, veggie-filled, healthy twist! Add the potatoes and 2 whole cloves garlic to a large saucepan, and fill halfway with water. Cover and bring to a boil, then uncover and reduce to a simmer. Cook until potatoes are nearly tender, about 12-15 minutes. Add cauliflower (be sure it is thawed so it doesn’t bring down the temperature of the water). When potatoes are tender when pierced with a fork, pour the vegetables into a large colander to drain. Transfer drained vegetables to a large mixing bowl, and mash to a puree using a potato masher. Add 2 tablespoons olive oil, 1 cup shredded cheddar, and season thoroughly with salt and pepper. Stir until mixture is well combined and cheese has completely melted. Set aside. Meanwhile, as potatoes are boiling, heat 3 tablespoons olive oil in a deep sauté pan over medium-high heat. Add 2 cloves minced garlic, onion, carrots, and parsnips, and cook until softened, about 7-9 minutes. Add mushrooms, thyme, cinnamon and tomato paste, and season with salt and pepper. Stir until well combined. Add red wine and cook until liquid has reduced, about 2 minutes. Add black beans and corn, stir until well combined, and season to taste with salt and pepper. Remove black bean mixture from heat and transfer to a large casserole dish. Use a spoon to spread mixture smoothly and evenly across the bottom of the dish. Top with the potato mixture, again spreading smoothly and evenly across the dish. Top with remaining 1/3 cup shredded cheddar. Bake until crust begins to turn golden, about 10-15 minutes, Serve. O M DOUBLE G. I just popped this in the oven and it tastes DELICIOUS. Since tomorrow is the first day of fall, I’m starting to prepare my vegetarian holiday spread. This was something that I was interested in taste-testing with my non-vegetarian boyfriend, since we’ll be having Christmas dinner at our house this year with my non-vegetarian family. THIS WILL BE ON MY TABLE!!! That’s wonderful, this is one of my favorites 🙂 Thanks so much for taking the time to send a note! 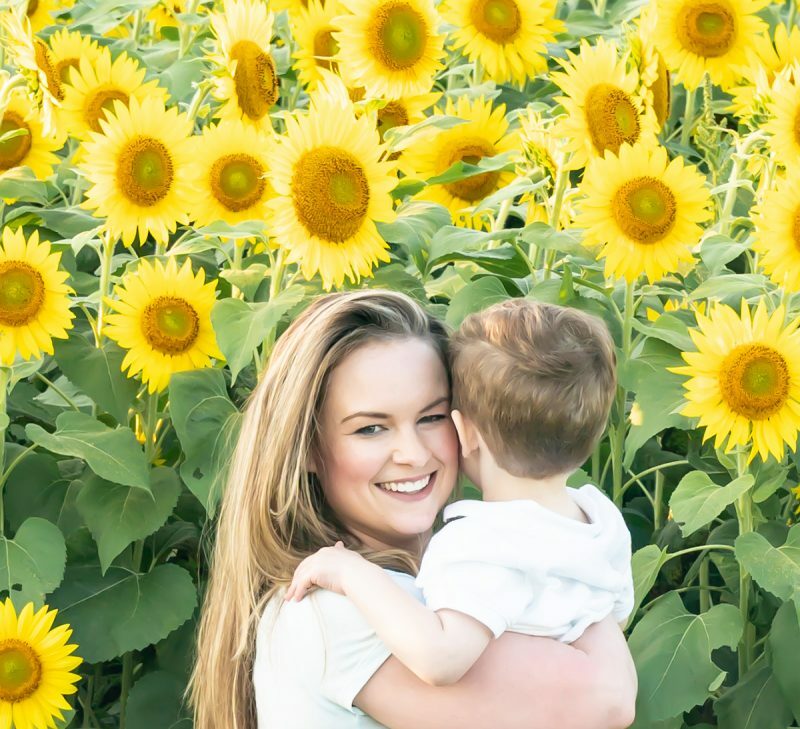 Hi, what is 4 tablespoons olive oil for?